Read more about the election results on our blog. StouffvilleConnects will conduct video interviews with the four key candidates in the Oak Ridges-Markham riding. Our first interview is with the incumben, Dr. Helena Jaczek. 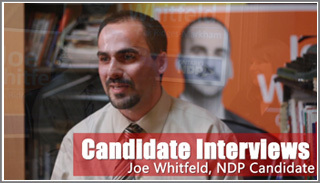 Our second interview with Joe Whitfeld, Stouffville's NDP candidate for Oak Ridges-Markham, is now ready! 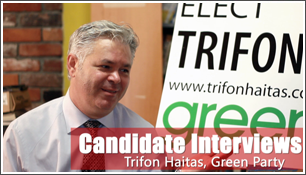 Trifon Haitas represented the Green Party in the federal election and he is now the party representative in the Ontario provincial election. After leading us to believe we would be granted an interview with Farid Wassef, PC candidate for Oak Ridges-Markham, we were told today (Sept. 29, 2011) that the interview was denied. We had hoped to give Farid the chance to address ethical questions that were raised about his background. After doing some research, here is what we can tell you about the local PC candidate: Who is Farid Wassef? We Wish We Knew.